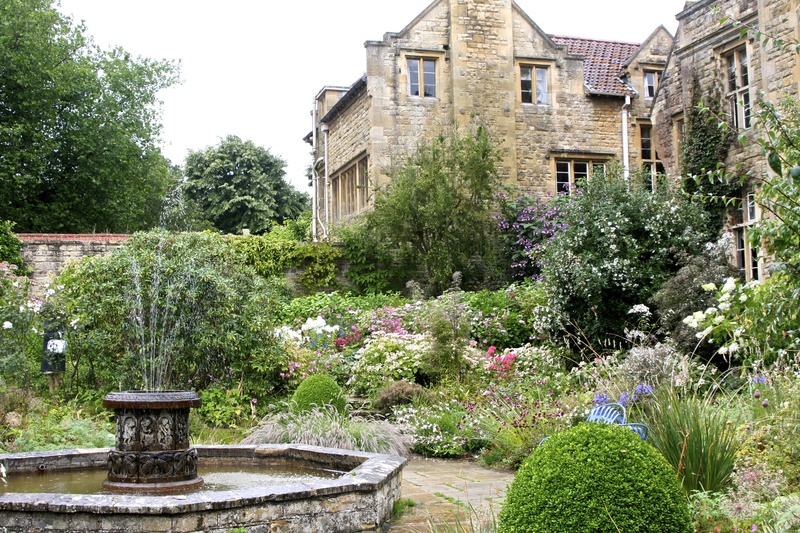 Hidcote Manor is known for its “outdoor rooms,” which include sculptured hedges and dramatic plantings. In my last blog we visited the gardens of Highclere Castle, Camers, and Abbey House. 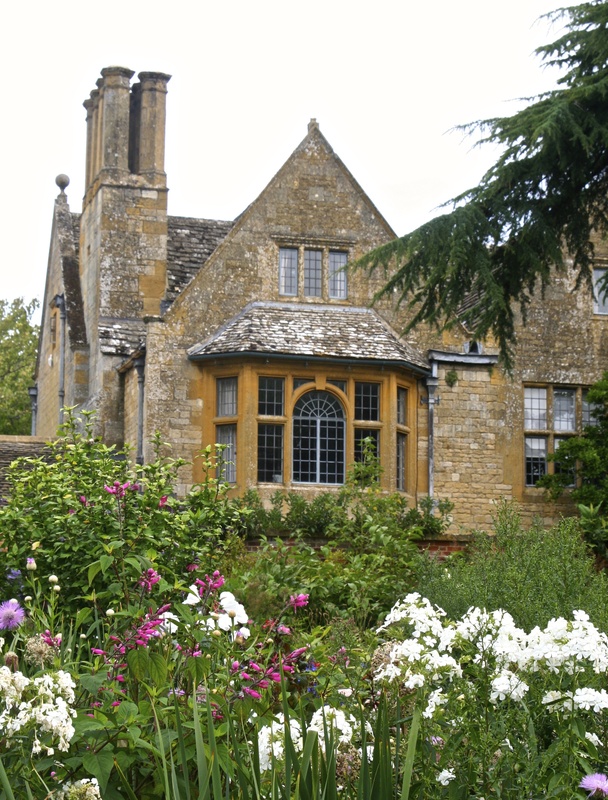 Today we move on to Hidcote Manor, Kiftsgate Court and Misarden Park. First up. 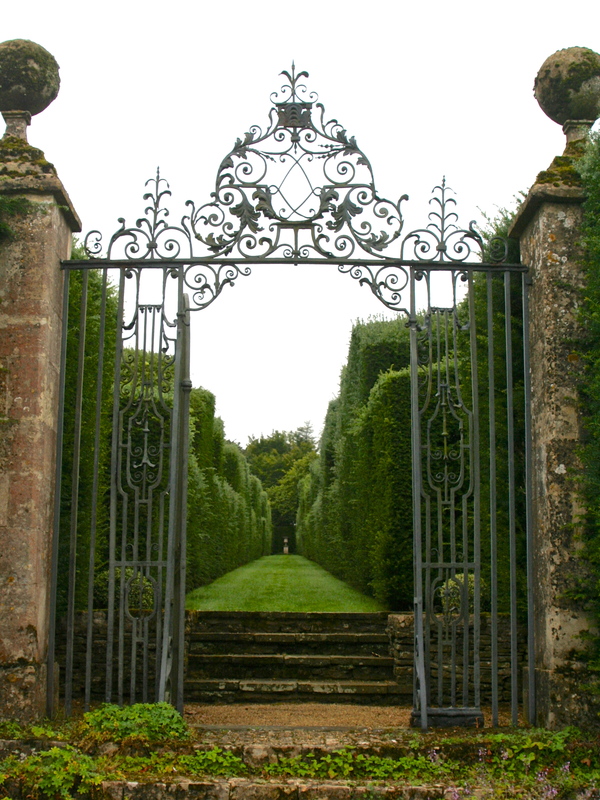 Hidcote Manor is referred to as the garden of “hedged rooms” and sculptured hedges. In fact, I read that the four miles of hedges require gardeners to work four days a week for seven months just to maintain them! 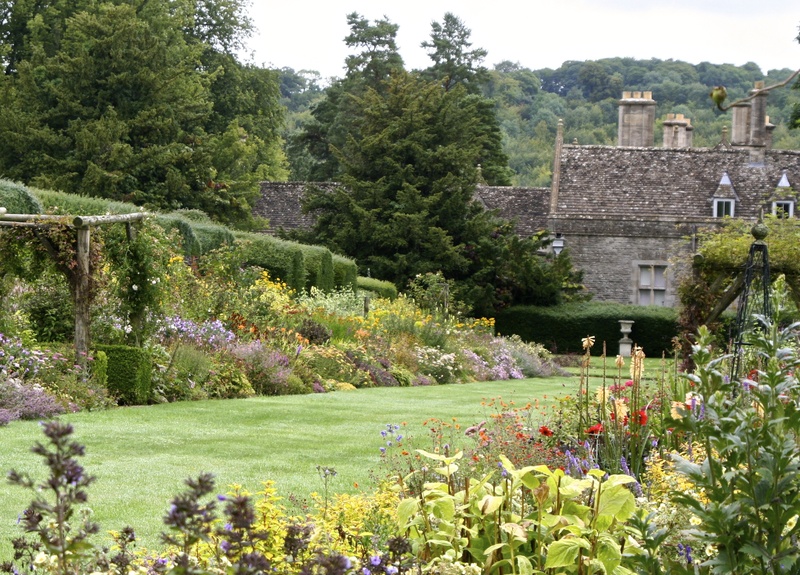 An American horticulturist and later a naturalized British citizen, Major Lawrence Johnson, spent 40 years creating the gardens on land his mother had purchased in 1907. 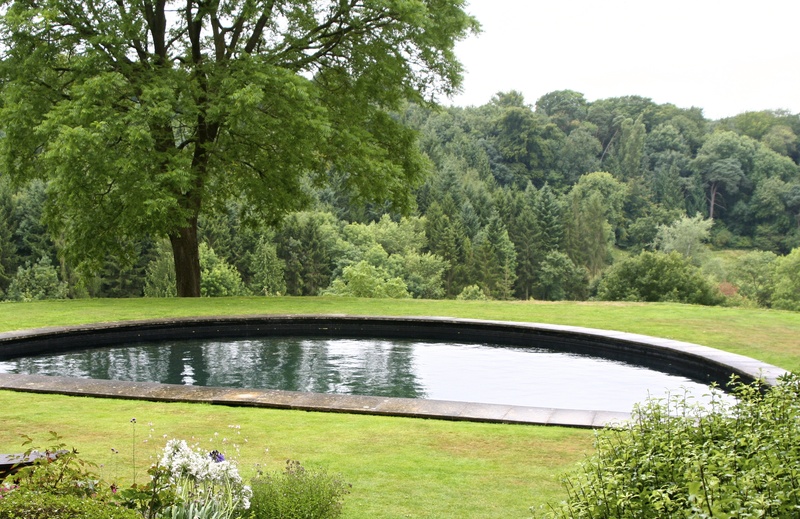 In 1948 he gave this estate to the National Trust. The Trust now advertises this site as an Arts and Crafts Garden. Despite overcast days, the colors were still striking. 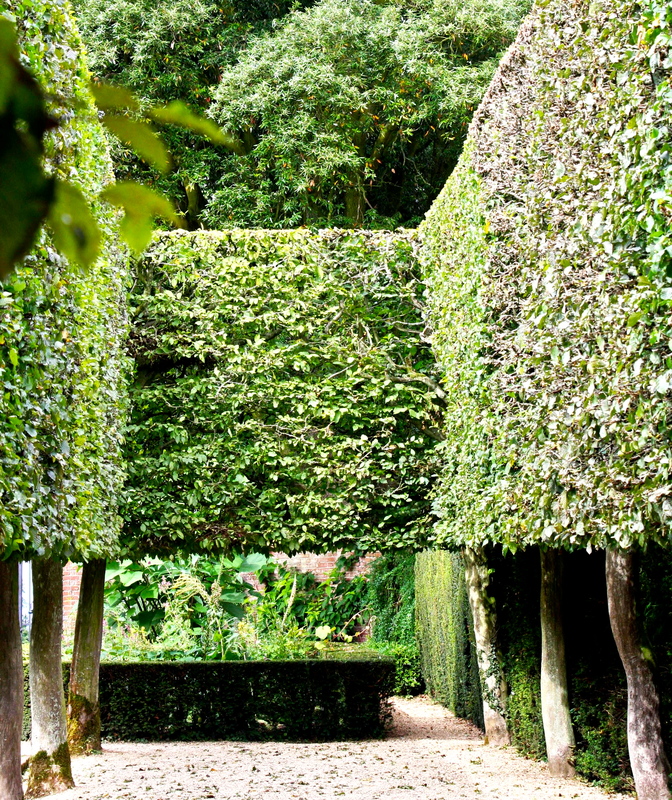 An example of a hedged room. 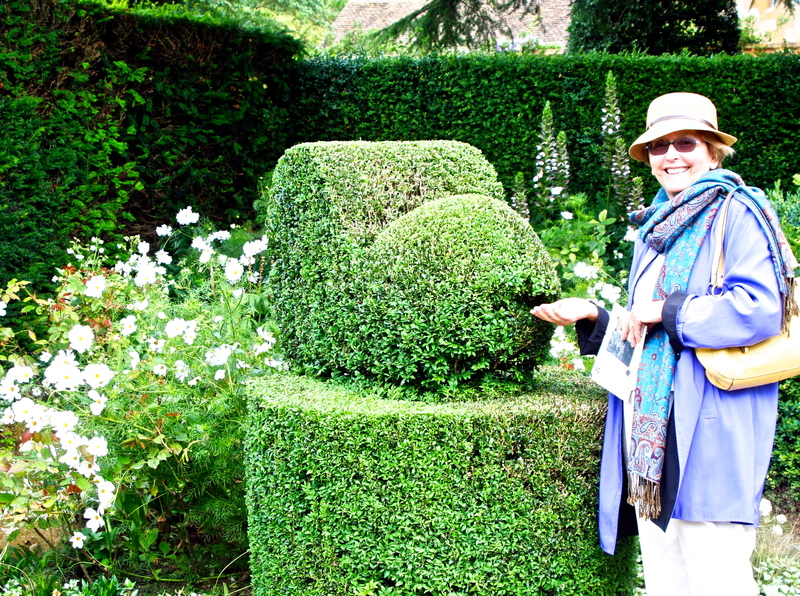 Jane and a sculptured hedge. 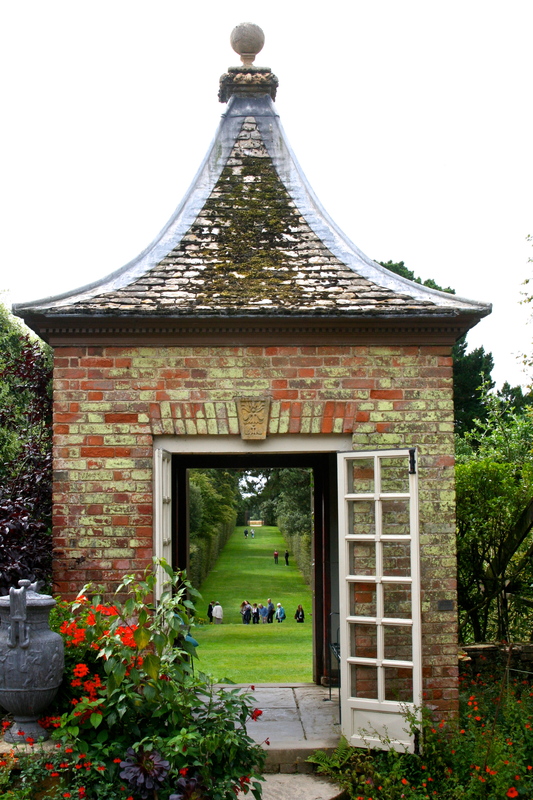 The Long Walk at Hidcote Garden. 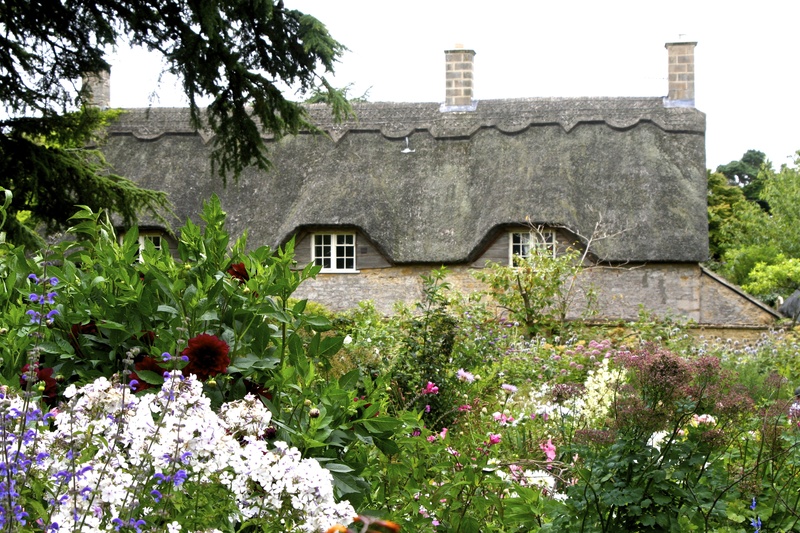 The village of thatched stone cottages behind the manor was a wonderful surprise. They were once home to Johnstone’s gardeners. Now the Trust rents them out. We visited Kiftsgate Court on a rainy day. Having just come from a very dry summer in Oregon, I was thrilled to soak up the rain. With rain comes green, green, green instead of drought, drought, drought! I thoroughly enjoyed the fountains and the reflection pool, which, we were told, is a great swimming hole. The colors that popped out on the rainy day were another treat, especially the blue door leading to who knows what treasures. Your guess is as good as mine. We were told that we had missed the prime time for full blooms. However, I was pretty impressed by what I saw. 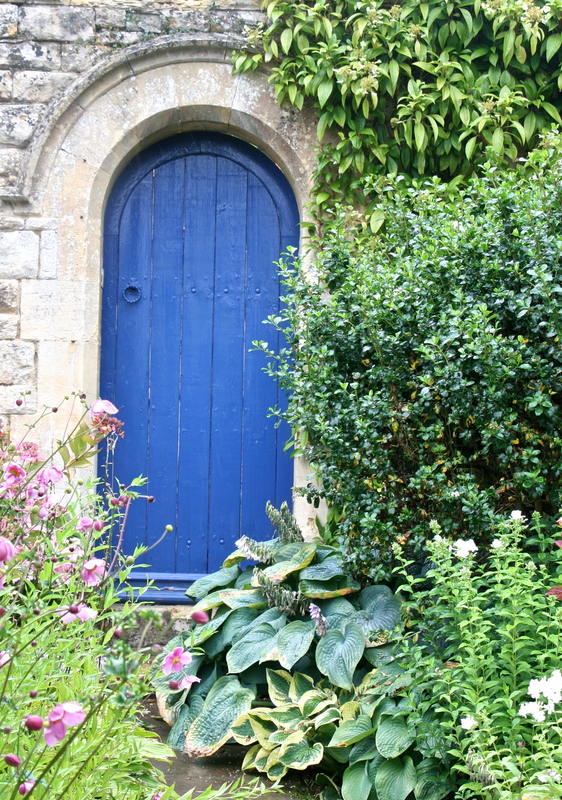 The blue door with its overgrown path was quite intriguing. Our path took us to this reflection pool. We learned that this was also used as a swimming pool. I was tempted! Just below this overlook was a herd of sheep, quite a magical contrast of white on green. Misarden Park/Estate began as a 17th century manor house, including 3000 acres and most of the village of Misarden (only the pub and school are not owned by the estate). The Wills, a tobacco family, bought this estate and village in 1913 and takes pride in both “the environment and the wider community.” For example, all electrical lines are buried. They will only rent to tenants who will contribute to the maintaining of the community and the estate. We were delighted to meet a future tenant and his friends who were renovating one of the cottages and happily took us on a tour. My first view of the residence, which is privately owned. It was occupied when we arrived. We respected the family’s privacy and gave the house wide berth. 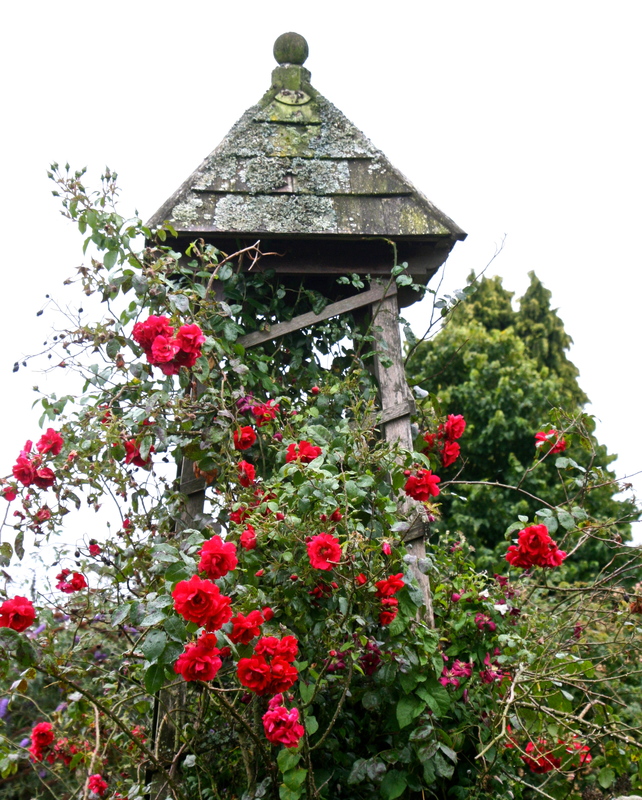 We had been looking for roses and finally found them— beautifully entwined in this old tower. A Hobbit tree? Let your imagination go on this one. 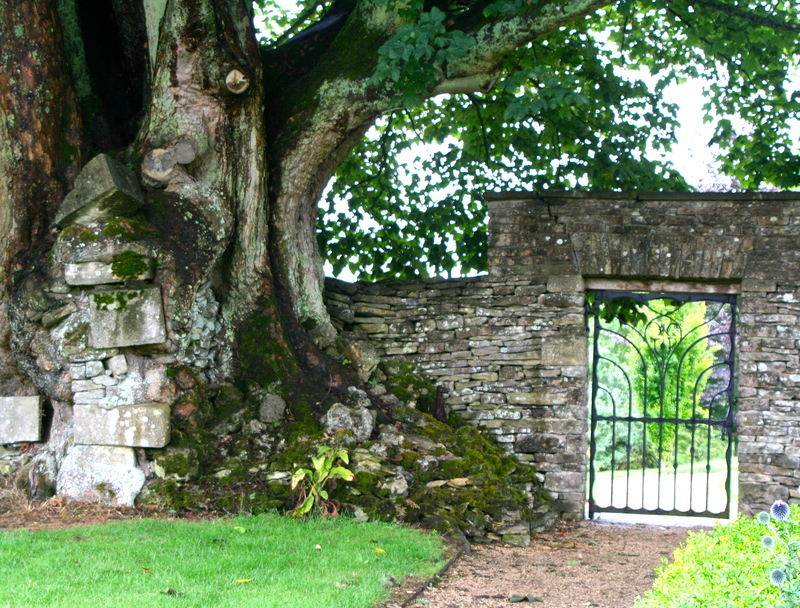 Yes, that is a tree packed with stones, all merged for a unique fence. Gateway to another Long Walk. How can one resist following it to the end? 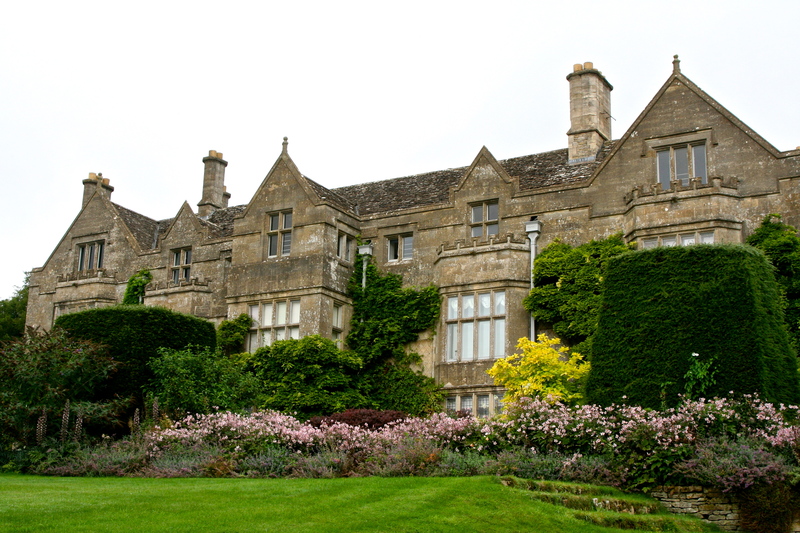 A final view of the residence with its Cotswold stone roof. 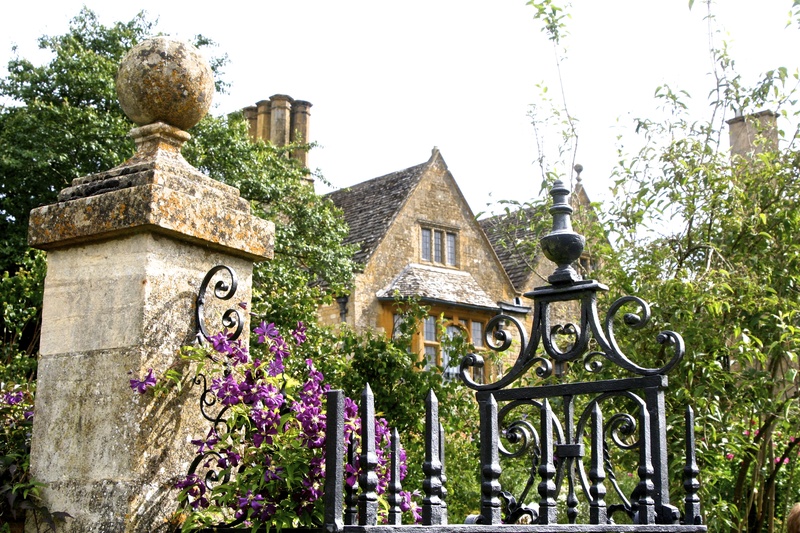 I will feature scenes from the village in another blog which captures the character of the small villages in the Cotswolds. 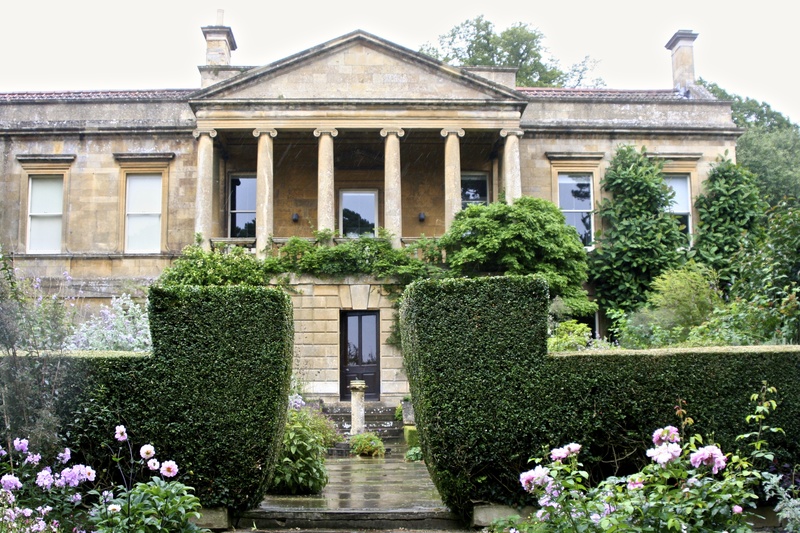 NEXT BLOG: Cerney House, Overbury Court, Whitcombe House, Wyndcliffe Court, Veddw (that’s Welsh, not a misspelling), and Hellens Manor gardens.